When my husband and I first started looking for ways to make money online, blogging came up as an option. Blah, blah, blah, and on and on the same statements went. Yeah we get it; we shouldn’t start a blog expecting to make money from it fast. That is until we heard about a blogger who started making $5k a month within A YEAR after learning how to monetize her site (she used to be a hobby blogger). After listening to her interview on The Side Hustle Show, our perspective completely changed. And on top of that, she had laid out exactly what to do if we wanted to get our blog making money within a year. And in three months after launching the blog (after using some of her tips and our newfound strategies), we were making more than my husband’s corporate job. But how do you even make money with a blog? That’s probably one of the most common questions I get, and I totally understand it! This one is one of the most low maintenance ways to make income from a blog. And it’s the one I make the most with! All you have to do is apply for an ad network, put them on your site, and you’re all good to go! The most common ad network beginner bloggers usually have is Google Adsense. When you apply for Adsense, you’ll see an application form you can fill out. It might take a couple days for them to get back to you, but once you’re accepted, you can easily install them with a simple WordPress plugin (I’m not crazy tech savvy, so this was great for me). Now when you start getting more views, I’d highly suggest signing up for Mediavine (the ad network I’m with now). The session threshold you need to be accepted is only 25k views a month, which is great, especially when other sites like Adthrive require 100k views a month. Mediavine pays A LOT more when it comes to ads and they’ll set the ads up for you. So I definitely recommend going with them. You can check out the tools I use to have a money-making blog here! This one is also simple, but requires some work on your end. Here’s the idea of what an affiliate is: An affiliate is a person who recommends a product (obviously one they know and use) to their readers. And when one of their readers clicks through (your special link) to the product and buys or signs up for a product, the affiliate gets a certain percentage of the sale. And this is at no extra cost to the reader. So Which Ones Am I Apart Of? Full Disclosure: If you click through one of my referral links for Bluehost web hosting and make a purchase, I will receive a commission at no extra cost to you. This helps me keep Chasing Foxes up and running and providing new content weekly. So what are the ones I’m signed up for and promoting? Bluehost, Convertkit, Elite Blog Academy (a course that shows you everything you need to know about blogging), and Amazon are my main affiliates at the moment. They’re both super easy to sign up for and great for beginners. Of course I’m just starting to promote others, but these 4 are my main affiliate income sources. Bluehost: If you use their hosting plan for your blog, you can become an affiliate. They pay you $60+ for every sale you make, which is why they’re probably my favorite. I also like promoting them because I started out with Bluehost as a beginner blogger with not a lot of money, and they were good to me and helped me out when I needed it. Elite Blog Academy: Or more affectionately known as EBA by it’s students, this is probably THE blogging class of blogging classes. It had the tips and steps I needed to become a full-time blogger and has made plenty of others into successful bloggers. I became an affiliate for them because I knew what they could do for others. EBA gives out a generous affiliate payout of 40% for each sale. Convertkit: Convertkit is an email provider which will help you send out newsletters to your subscribers (this also means a new way to sell affiliates to readers as well 😉 ). It’s honestly the best and easiest email providers I’ve every used AND they have recurring monthly affiliate payments (!!). This means that because the people who sign up have to pay monthly for Convertkit, you also get a monthly payment. It’s not just a one time thing. Their affiliate payout is 40% for each sale. – You can check out Convertkit here. Amazon: Amazon’s affiliate program is great if you want to recommend an awesome book or product you used for your house (as an example). Their affiliate payouts aren’t the biggest, however, you also get a commission if they purchase anything else on Amazon (not just the product you recommended) over the next few days. Note on Affiliates: Many companies have affiliate programs you can sign up for, so search for some of your favorite brand and products and see if you can start recommending them as an affiliate. One Last VERY Important Note: If you want to learn how to sell affiliate products like a pro, then I’d definitely check out this class by Michelle from Making Sense of Cents. She Makes over $50k a month on affiliates so she seriously knows what she’s doing. 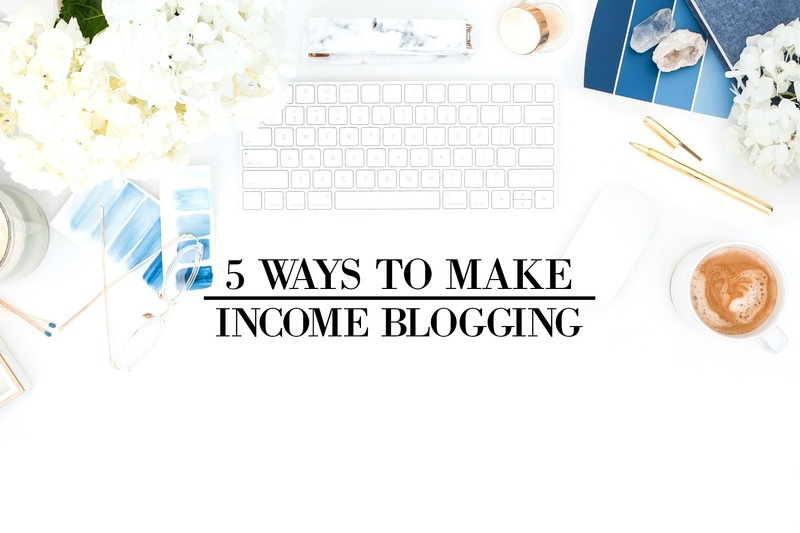 Now these are just a couple ways that I personally make income from my blog, but here are some ideas from other bloggers. Sponsored Posts: This is a post that’s sponsored by a certain brand that’ll pay you to write about them and/or their product. A good way to find sponsored post opportunities are on sites like blogher.com. eBook: Whether it’s a recipe eBook or how to work from home eBook, I know plenty of bloggers who have created their own eBook and been successful. And it doesn’t have to be a novel! It can be short and sweet but packed with great info. You can create one by taking blog posts you’ve already written and adding some more tips, advice, and steps that you hadn’t given in your free blog posts. Launching Your Own Course: In the class Elite Blog Academy, Ruth (the creator of the course), talks about how if you start getting more than 3 questions on the same topic, you need to create a course. So whether it’s how to make money with affiliates, start a budget that will actually work, or start a food blog, you can make good money. Now whether you’re a new blogger or someone looking to find more ways to make income with their site, I hope I was able to help you out! And if you have any questions at all, then don’t hesitate to ask!